In the second decade of the twenty-first century, almost wherever one looked, from the trampled meadows and silted streams of the Sierra to the depleted fishway of Pyramid Lake, organizations and individuals were hard at work undoing 150 years of decimation wrought upon the Truckee River by indifferent, greedy, and shortsighted humanity. In the Sierra, land was acquired along Old Creek, the Verdi-Floriston frontage, Gray Creek, Weber Lake, Lacey Meadows, Independence Lake, Royal Gorge and Summit Creek to protect wildlife and water quality and sometimes to prevent development projects. At Trout, Prosser, Perazzo, Gregory, Dry and Martis creeks, natural channels were being restored to revive wildlife habitat, prevent erosion and silting, revive meadows/wetlands, and purify the water. 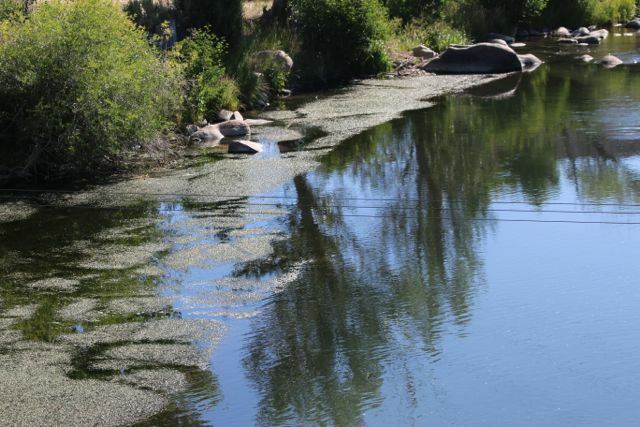 Efforts were under way to greatly reduce or even eliminate the invasive Eurasian watermilfoil that had destroyed the Lahontan cutthroat trophy fishery at Martis Creek. In 2014, a five-to-eight-year effort began to restore the Truckee Wetlands over twenty-eight acres. Downstream from Sparks, the Nature Conservancy led a long-term effort to undo the artificial and destructive channelization done by the Army Corps of Engineers in the 1960s which had depleted wildlife and natural vegetation while making floods more damaging downstream. Over a ten-mile stretch, the conservancy set out to re-create meanders, revegetate the banks, eradicate the destructive whitetop weed, and renew the old floodplain so flood waters could once again spread naturally rather than rushing forward in the highest possible volume. By 2014, restoration had been completed at McCarran Ranch, 102 Ranch, Lockwood and Mustang Ranch, and was nearly complete at the Tracy reach. Wildlife bloomed, including frogs, fish and birds not seen for years. Also on the restoration list were Granite Pit, Eagle Pitcher, Ferretto Ranch, the “railroad cut,” the I-80 rest stop, Wadsworth, and a spot above the I-80 bridge near Fernley. Down toward Pyramid Lake, the cities of Reno and Sparks joined the Nature Conservancy to complete a three-quarter-mile riparian restoration project just below Derby Dam. In 2008 the Pyramid Lake Paiute Tribe received federal approval for a water quality control plan and began monitoring pollutants entering the river. The tribe also built a 60-mile fence to stop grazing cattle from destabilizing the banks, as well as to reduce nitrogen runoff from farms, restabilize the banks and begin restoring wetlands. Only in the Truckee Meadows was this passion for restoration not true. To be sure, there had been some modest attempts at naturalization, principally along Chalk Creek, with financial assistance from the Truckee River Fund. 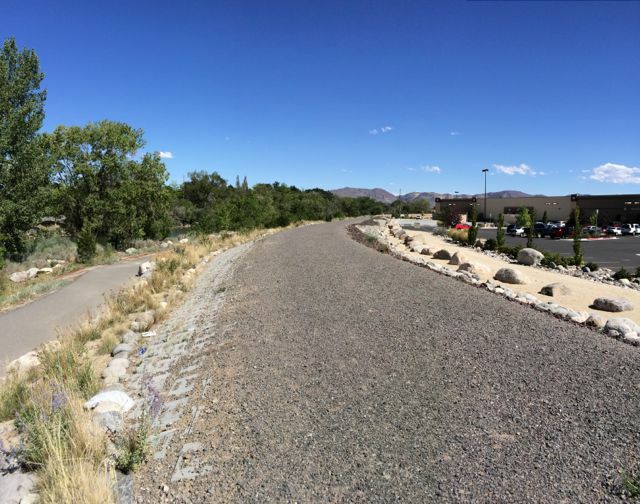 Also, much weeding was done of invasive plants along the Truckee, with some replacement plantings of native species. Reno and Sparks designed a project to restore lower Steamboat Creek. Later the fund financed the installation of water-treatment structures to prevent storm water pollution from entering Crane Ditch, a tributary of the Steamboat. The Washoe-Storey Conservation District spearheaded the creation of a community-wide Steamboat Creek Restoration Master Plan, but the proposals remained voluntary for landowners. Far more promising was the commitment of the Regional Transportation Commission to restore Steamboat as part of construction of the Southeast Connector Road between Reno and Sparks with meanders and new wetlands to filter pollutants. But the project remained uncertain as of 2014 with opposition from a determined Truckee Meadow environmental group and the Pyramid Lake Paiute Tribe—and more significantly, the federal Environmental Protection Agency—all of which said digging up the wetlands for Phase 2 could send deadly methylmercury into the Truckee. But on the most important undertaking of all—the massive Truckee River flood-control project—the old ways were winning out, the old ways that ignored natural beauty and processes and that would channelize or semi-channelize the river for significant stretches. If not the concrete canyon that the Los Angeles River had become, the Truckee would nonetheless be far from the natural river that the community had said it desired only a few years earlier, and that officials had actually approved. financially, but as it grew more esthetically complex, the overall bill rose. Even more devastating was the Great Recession, which began in late 2007 and from which Nevada was still sporadically recovering in 2014; the value of downtown buildings and businesses plummeted, especially that of the casinos, which reduced their assessed value and consequently the economic value of protecting them from floods. At the same time construction costs continued their slow but seemingly inevitable climb, making the project ever more expensive. Thus the corps was obliged to consider ever less financial aid because of its shrinking cost-benefit formula, which insisted that a project’s benefit not just equal the cost but exceed it—none of which would have mattered, of course, had the corps, in the ten years between 1997 and 2007, approved the project in a timely manner. Then too, many observers believed that while environmental quality was listed as a federally sanctioned benefit, a naturally functioning river was difficult to quantify monetarily and therefore played a role in the corps’ funding reluctance. Quite possibly this latter reason had always been part of the corps’ unofficial disinterest, even though various studies had demonstrated that over the long run natural systems protected communities far better and more cheaply than floodwalls and channelization. But of course nobody knew because the corps remained inscrutable. Finally, the Great Recession had one more debilitating effect: the decline of property values had created a commensurate decline in taxable value, which meant a sharp decline in the amount of money that local governments could raise for the project. Meantime the many advocates for the river had grown largely silent. Whether from exhaustion from so many years of campaigning or merely that their attention had been diverted to other environmental concerns, they offered little of the robust oversight that had been their forte for so long. Thus at last, in 2013, the Truckee River Flood Management Authority moved resolutely to decrease the size of the project to make it more affordable—which meant drastically reducing and even eliminating environmental and recreational aspects, and returning to the old love affair with floodwalls. Its members felt they had no choice. Better Ways to do Flood Control? But was this the only way? Were there nuances left unspoken, alternatives unapproached? There did seem to be. To begin with, officials could have returned to the community, seeking once again its desires, suggestions and support. The community, so engaged, might have created a “Protect the River” committee aimed at finding additional funding for flood control. If skeptics would have said that no such committee could ever raise half a billion dollars, optimists might have said maybe not, but what about two million, or even one million or $500,000? Whatever was raised could have been added to the mix, retaining one setback levee, maybe even two from the original Living River Plan. Whatever was saved would have been better than nothing. Better yet, why not a horde of organizations and agencies devoted to restoring the river? Not possible? One had only to look again at the Sierra, where a vast array of groups were devoting enormous reservoirs of energy and fund-raising ability in compelling and effective ways. Often these efforts were led by the Truckee Donner Land Trust, the Truckee River Watershed Council, and the Nature Conservancy, but there were so many more: the Tahoe Donner Association, the Sierra Nevada Alliance, the Tahoe Resorts Environmental Fund, Martis Fund, Truckee Tahoe Community Foundation, Sierra Nevada Partnership, and Northern Sierra Partnership—not to mention support from the Tahoe Mountain Resorts Environmental Fund, Truckee Development Corporation, California Wildlife Conservation Board, California Resources Agency, California Department of Fish and Game, American Land Conservancy, national Trust for Public Land, California State Parks, California State Water Resources Control Board, Lahontan Regional Water Quality Control Board, NV Energy, California Natural Resource Agency, the David and Lucille Packard Foundation, the United States Geological Survey, Truckee River Trout Unlimited, The Palisades, Mountain Area Preservation, Sierra Business Council, North Fork American River Alliance, Sierra Club, Sierra Watch, Truckee Donner Public Utility District, Truckee Sanitation District, Truckee Tahoe Airport District, Alpen Group, Tahoe Resource Conservation District, the Tahoe Regional Planning Agency, and the Truckee River Fund created by the Truckee Meadows Water Authority in Reno, which made $2.4 million in matching grants, with $10 million in matching funds from the Truckee River Watershed Council alone. If it took a village to save the upper Truckee watershed, that village was there, all across the mountains. But not in the Truckee Meadows. You could point to a few leading organizations—among them the City of Reno, the Truckee River Yacht Club, Keep Truckee Meadows Beautiful, and most especially the Truckee River Fund, which spent $4.3 million on the aforementioned polluted runoff from creeks (mainly Chalk Creek), riverbank weeding, and restoration in general. And there were other players, principally the city of Reno, but also Sparks, Washoe County, the Nevada Land Conservancy, the University of Nevada, U.S. Fish and Wildlife, River Partners, Champions of the Truckee River, Great Basin Institute, Nevada Conservation Corps, Nevada EcoNet, Big Brothers Big Sisters, and the Nevada Department of Wildlife—but this paled compared to the avalanche of advocacy in the Sierra. Truckee Meadows officials might complain, with some justice, that there were many more dams, creeks, meadows, etc., to care for in the mountains. Even so, in looking at efforts upstream and downstream and then at the Truckee River between Verdi and Vista, advocates of a natural river could only call the overall Meadows response an embarrassment of indifference, a lethargy of the soul. What could new or existing organizations have been doing in the Meadows? Perhaps framing a plan to naturalize the path by planting native vegetation to block out the many warehouses, trucking facilities and other commercial enterprises that diminished the outdoor naturalness along the north bank. For encouragement, one had only to look upstream again, this time at the town of Truckee’s Trails and Bikeways Master Plan and its ongoing construction of a riverfront Legacy Trail. As a key element of the trail, which when complete would extend from the Glenshire neighborhood at the east end of Truckee all the way to Donner Memorial State Park, the town insisted that “Native vegetation and existing features (rock outcroppings, rolling topography) should be used wherever possible and supplemented by additional landscape screening and buffering to promote a more enjoyable and safer user experience.” To be sure, this approach also aimed at protecting private property, including homes, from trespass and to assure privacy. Nonetheless, the buffer would prevent the railroad and other manmade intrusions from intruding upon the outdoor experience. This would have been particularly helpful in Sparks from a little way east of Cottonwood Park to Vista, which used to be one of the most quiet and nurturing sections of the path with thick clumps of vegetation on both sides but had lately become the least pleasant, with the vegetation on commercial size largely gone; now there was no buffer at all between walkers and the busy, noisy, steadily expanding conglomeration of businesses and, behind them, traffic-loaded Greg Street, not to mention the auto wreckage yard and the truck-parts-and-equipment business which had been there for many years at the far end of the path and had never been shielded off. Meadows residents would also have found it helpful to peruse the town of Truckee’s 2005 Downtown River Revitalization Plan, created as part of a renaissance in restoration because “a river does run though here.” One goal was to move river-unattractive businesses away from the banks and replace them with trails, overlooks, bridges and parks, as well as suitable retail and residential redevelopment. Then there was the $1 million restoration project for 28 acres of Truckee Wetlands, begun at Truckee in 2014. Why not a similar project or projects in the Truckee Meadows, as circumstances and funding made opportunities available? At the far end of the spectrum of possibilities, could local organizations have spoken out forcefully about the flood-protection plan, sought benefactors, discussed alternatives in a meaningful way? Or could Truckee Meadows authorities have considered building the flood project in distinct phases over a number of years only as full funding became available? To be sure, that seemed far less likely both politically and protection-wise because since the arrival of the white man, the Truckee had flooded once every ten years on average; the huge flood of 1997 was seventeen years in the rear-view mirror; but in 2005 a “modest” flood had again inundated parts of downtown Reno and the Sparks industrial center; and 2014 was nine years removed from that. If officials felt a compelling urgency at this point and wanted not to be harassed by outraged residents if they failed to provide protection when they might have, and another devastating flood swept down from the Sierra, one would find it difficult to gainsay them. Even so, could they have begun construction on sections where even the Living River Plan endorsed floodwalls, and hoped that an energized community could provide additional funding or ideas to retain more of the natural approach when it came time to build floodwalls where expanded levies had been envisioned? One would never know. Still, in extremis, it would be good to remember that nothing is eternal. What was done today could be undone or redone tomorrow. Not in a year, or five years, or even a decade or more—but sometime. So, for instance, where the width of levees was reduced, where two levels were constrained to one, could these levees not, at some future date, be reconfigured to the original plan? Perhaps all that would be required would be to retain the necessary property in public ownership until that day arrived. As for the added floodwalls, at some time far, far into the future, who could say? Time could offer many opportunities; and, as everyone knows, a great deal of time is coming always. Certainly Boise, Idaho, felt that way in creating its 25-mile greenbelt along the river that ran through the heart of the community; with all those years in mind, it completed its first plan in 1968, persevered against all obstacles, and in 2014 was still improving and expanding its own greenchild.